The Tiberian and Accentual Systems. Date of Introduction of Vocalization. Controversies About Age of Vocalization. All Semitic script, excepting Ethiopic and Assyro-Babylonian, the latter of which in its origin is held by many to be not Semitic, is purely consonantal, the reader being left to supply the vowels. The same feature is found in the Egyptian and Berber languages, not to speak of other tongues which have borrowed the Arabic alphabet. This circumstance renders the reading of Semitic script in many cases ambiguous even in a living language. To obviate such ambiguity the Semitic languages have developed three methods. The oldest method is to denote the vowels by the vowel-letters (also ). The employment of vowel-letters shows a gradual development. At first used but sparingly to denote final vowels (Mesha Stone, Phenician inscriptions), they came to mark vowels long by nature (Arabic, early Hebrew), then, occasionally, tone-long vowels (Biblical Hebrew), and finally also short vowels (Aramaic dialects, later Hebrew). This method of vocalization has been retained in Mandean and partly in Samaritan. But since the vowel-letters were not sufficient to mark the exact shades of the vowel-sounds, some of the Semitic languages (i.e., those which were in possession of sacred books in whose recitation exactness was imperative) developed systems of vowel-signs. The employment of such signs proceeded along two lines. The Ethiopic, whose vowel-system probably dates from the fourth century C.E., has attached its vowel-signs to the body of the consonant, so that there are as many modifications of the form of each letter as there are vowels. Hebrew, Syriac, and Arabic, on the other hand, have their vowel-signs written independently, above, below, or within the letters. 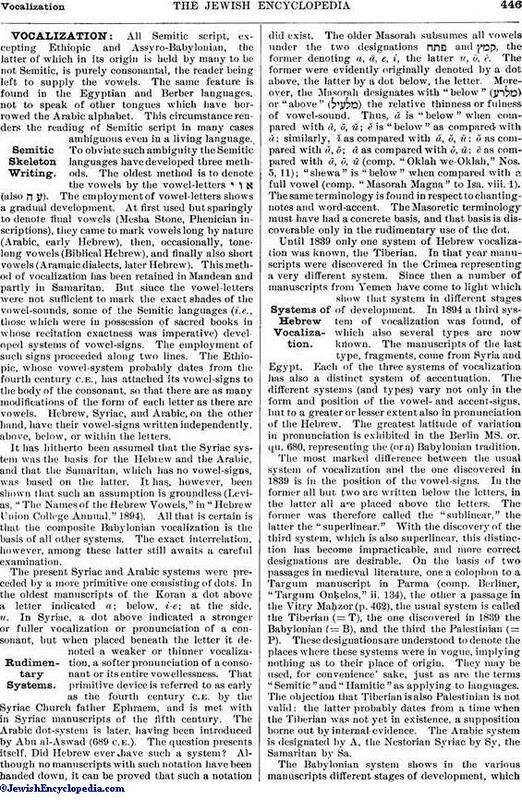 It has hitherto been assumed that the Syriac system was the basis for the Hebrew and the Arabic, and that the Samaritan, which has no vowel-signs, was based on the latter. It has, however, been shown that such an assumption is groundless (Levias, "The Names of the Hebrew Vowels," in "Hebrew Union College Annual," 1894). All that is certain is that the composite Babylonian vocalization is the basis of all other systems. The exact interrelation, however, among these latter still awaits a careful examination. The present Syriac and Arabic systems were preceded by a more primitive one consisting of dots. In the oldest manuscripts of the Koran a dot above a letter indicated a; below, i-e; at the side, u. In Syriac, a dot above indicated a stronger or fuller vocalization or pronunciation of a consonant, but when placed beneath the letter it denoted a weaker or thinner vocalization, a softer pronunciation of a consonant or its entire vowellessness. That primitive device is referred to as early as the fourth century C.E. by the Syriac Church father Ephraem, and is met with in Syriac manuscripts of the fifth century. The Arabic dot-system is later, having been introduced by Abu al-Aswad (689 C.E.). The question presents itself, Did Hebrew ever have such a system? Although no manuscripts with such notation have been handed down, it can be proved that such a notation did exist. The older Masorah subsumes all vowels under the two designations and , the former denoting a, ä., e, i, the latter u, ō, ē. The former were evidently originally denoted by a dot above, the latter by a dot below, the letter. Moreover, the Masorah designates with "below " ( ) or "above" ( ) the relative thinness or fulness, of vowel-sound. Thus, ă is "below" when compared with ā, ō, ū; ě is "below" as compared, with ă; similarly, ĭ as compared with ă, ŏ, ŭ; ŏ as compared with ă, ō; ā as compared with ō, ū; ē as compared with ā, ō, ū (comp. "Oklah we-Oklah," Nos. 5, 11); "shewa" is "below" when compared with a full vowel (comp. "Masorah Magna" to Isa. viii. 1). The same terminology is found in respect to chanting-notes and word-accent. The Masoretic terminology must have had a concrete basis, and that basis is discoverable only in the rudimentary use of the dot. Until 1839 only one system of Hebrew vocalization was known, the Tiberian. In that year manuscripts were discovered in the Crimea representing a very different system. Since then a number of manuscripts from Yemen have come to light which show that system in different stages of development. In 1894 a third system of vocalization was found, of which also several types are now known. The manuscripts of the last type, fragments, come from Syria and Egypt. Each of the three systems of vocalization has also a distinct system of accentuation. The different systems (and types) vary not only in the form and position of the vowel- and accent-signs, but to a greater or lesser extent also in pronunciation of the Hebrew. The greatest latitude of variation in pronunciation is exhibited in the Berlin MS. or. qu. 680, representing the (or a) Babylonian tradition. 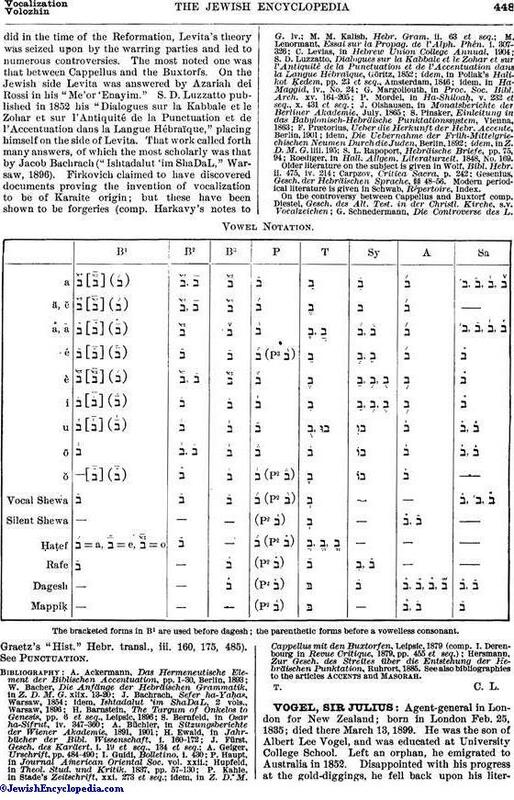 The most marked difference between the usual system of vocalization and the one discovered in 1839 is in the position of the vowel-signs. In the former all but two are written below the letters, in the latter all are placed above the letters. The former was therefore called the "sublinear," the latter the "superlinear." With the discovery of the third system, which is also superlinear, this distinction has become impracticable, and more correct designations are desirable. On the basis of two passages in medieval literature, one a colophon to a Targum manuscript in Parma (comp. Berliner, "Targum Onḳelos," ii. 134), the other a passage in the Vitry Maḥzor (p. 462), the usual system is called the Tiberian (= T), the one discovered in 1839 the Babylonian (= B), and the third the Palestinian (= P). These designations are understood to denote the places where these systems were in vogue, implying nothing as to their place of origin. They may be used, for convenience' sake, just as are the terms "Semitic" and "Hamitic" as applying to languages. The objection that Tiberian is also Palestinian is not valid: the latter probably dates from a time when the Tiberian was not yet in existence, a supposition borne out by internal evidence. The Arabic system is designated by A, the Nestorian Syriac by Sy, the Samaritan by Sa. The Babylonian system shows in the various manuscripts different stages of development, whichcan, however, be reduced to three leading types: the composite type (B1), represented chiefly by the "Codex Petropolitanus," dated 916; the simplified type (B2), found chiefly in Targum manuscripts and Neo-Hebrew texts; and the type (B3), represented by the Berlin MS. or. qu. 680. The first two types show not infrequently Tiberian influence. The in B1 is Tiberian; so is the "dagesh"-point in B2. B1 denotes dagesh and vowellessness, not, as do all other types and systems, by a sign attached to the consonant, but by a modification of the preceding vowel. Its phonetic theory is evidently different from all the rest. One will not go far astray in seeing here the influences of the Hindu and the Greek grammatical system respectively. B2 is a simplification of B1 adapted to the needs of Aramaic. B3 is a modification of B1 with the help of P, from which system it has borrowed its "rafe"-sign and the conception of dagesh. The Palestinian system has come down in a few fragments, not all of which have yet been published. This system also shows a gradual development; the classification into types, however, must remain tentative until all the material shall have been made accessible. According to Dr. Kahle ("Der Masoretische Text," p. 29, note 1), the fragments of the Cairo genizah, still unpublished, present the oldest type (P1); an intermediate type was published by the writer in the "American Journal of Semitic Languages and Literature," vol. xv. (P2); the third type (P3) is contained in the texts published by Neubauer (in "J. Q. R." vii. 361) and Kahle (Stade's "Zeitschrift," xxi. 273). This system is based on B1 and shows the transition to B3, T, Sa, Sy, and A. The position of the vowel-signs in P is, as in B, above the letters and thrown to the left, or, more correctly, over the space between the letters when the spelling is defective, and over the vowel-letters when the text is written "plene." The cases of plene writing have evidently determined the position of the vowel-sign. It is not impossible that the inventors of these two systems, like the later grammarians, supposed every vowel to be followed actually or virtually by a vowel-letter, so that the sign may always be intended for the latter. While the above is the rule, the vowels are at times found within the letter (B3) or beneath it; sometimes both below and over the letter; at other times the vowel-sign above the consonant is repeated over the following vowel-letter (P2). The dagesh-, mappiḳ-, and shewa-signs (see Notation Table, p. 448) may be placed on the consonant to which they belong or on the preceding consonant. P3 differs from P2 chiefly by having differentiated the e-vowel into è and é. The Tiberian system is based on B1 (comp. Prætorius in "Z. D. M. G." liii. 195) and P. Like P3, it has differentiated the e-vowel. All its signs, with the exception of two within and one above the consonants, are written below the letters. The accentual system seems to have originated with P, since the vowel- and accent-signs in that system seem to have been cast in one mold. The accents were then transferred to B1 and mechanically supplemented by the conjunctive accents, which had later developed in T. As Prætorius has shown, these conjunctive accents are based on the Greek neumes of the early Middle Ages. The disjunctive accents, however, seem to have developed from the Greek interpunction-marks (comp. Kahle in "Z. D. M. G." lv. 167 et seq. ; see also Consolo in "Verhandlungen des Internationalen Orientalisten-Kongresses," xiii. 214 et seq.). In trying to determine the date when vocalization was first introduced the terminus a quo and the terminus ad quem must first be ascertained. Elijah Levita had already pointed out that the Talmudim and Midrashim do not mention vowel-signs or vowel-names, in spite of there having been abundant opportunity to do so. From this fact he concluded that vocalization and accentuation are post-Talmudic. The earliest dated mention of vocalization is that of Saadia Gaon and his contemporaries. Between the dates 500 and 900 the following data are to be considered: Even Aaron ben Moses ben Asher, whose ancestor in the sixth generation flourished in the second half of the eighth century, was ignorant of the origin of the vowel-points. A still older authority than Ben Asher the Elder, R. Phinehas, the head of the academy, is quoted as authority for T. If this R. Phinehas be identical with the payyeṭan mentioned after Ḳalir b. Saadia Gaon ("Agron," ed. Harkavy, p. 112), he must have lived early in the eighth century, or must have been contemporary with Khalil ibn Aḥmad (719-729), to whom the introduction of the Arabic system is attributed. Assuming that A and T were introduced about 750, these being based on P and B, the date for P must be about 700, since the age of P is conditioned by the zero-sign it uses, and that sign, together with the system of Arabic numerals to which it belongs, was first introduced by Mashallaḥ (comp. Numbers and Numerals). The date for B1 must, therefore, be between 500 and 700; it is at present impossible to give the exact date. If vocalized manuscripts exist which go back to the seventh century (Harkavy's note to the Hebrew translation of Graetz's "Hist." iii. 160), then the date of B1 must be about 600. The contention of C. D. Ginsburg ("Introduction to the Hebrew Bible," p. 451) that the late "Masseket Soferim." did not know the vowels is out of the question. How could it be ignorant of vowels when it knew the accents? The work is a compilation, and the passage Ginsburg quotes to prove his deduction is taken from older sources. The Nestorian Syriac vocalization is no doubt contemporary with A and T (comp. Duval, "Gram. Syr." § 71). 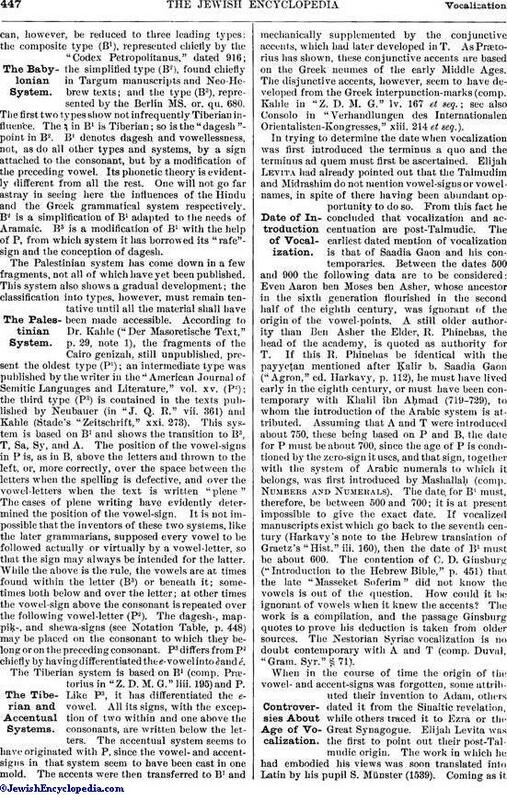 When in the course of time the origin of the vowel- and accent-signs was forgotten, some attributed their invention to Adam, others dated it from the Sinaitic revelation, while others traced it to Ezra or the Great Synagogue. Elijah Levita was the first to point out their post-Talmudic origin. The work in which he had embodied his views was soon translated into Latin by his pupil S. Münster (1539). Coming as itdid in the time of the Reformation, Levita's theory was seized upon by the warring parties and led to numerous controversies. The most noted one was that between Cappellus and the Buxtorfs. On the Jewish side Levita was answered by Azariah dei Rossi in his "Me'or 'Enayim." S. D. Luzzatto published in 1852 his "Dialogues sur la Kabbale et le Zohar et sur l'Antiquité de la Punctuation et de l'Accentuation dans la Langue Hébraïque," placing himself on the side of Levita. That work called forth many answers, of which the most scholarly was that by Jacob Bachrach ("Ishtadalut 'im ShaDaL," Warsaw, 1896). Firkovich claimed to have discovered documents proving the invention of vocalization to be of Karaite origin; but these have been shown to be forgeries (comp. Harkavy's notes to Graetz's "Hist." Hebr. transl., iii. 160, 175, 485). See Punctuation. Roediger, in Hall. Allgem. Literaturzeit. 1848, No. 169. Gesenius, Gesch. der Hebräischen Sprache, §§ 48-56. Modern periodical literature is given in Schwab, Répertoire, Index. Hersmann, Zur Gesch. des Streites über die Entstehung der Hebräischen Punktation, Ruhrort, 1885. See also bibliographies to the articles Accents and Masorah. The bracketed forms in B1 are used before dagesh; the parenthetic forms before a vowelless consonant.